When it comes to Dungeons & Dragons, I’m always on the lookout for twists and deviations from the game’s default setting—I’ve played in that setting a number of times, and variety is the spice of life. For a long time I have wanted to play and/or DM a campaign set in a world inspired by Aesop’s Fables or Redwall, with talking animals and woodland adventures and such, but it seemed like a ton of work to put the races and mechanics of such a setting together. 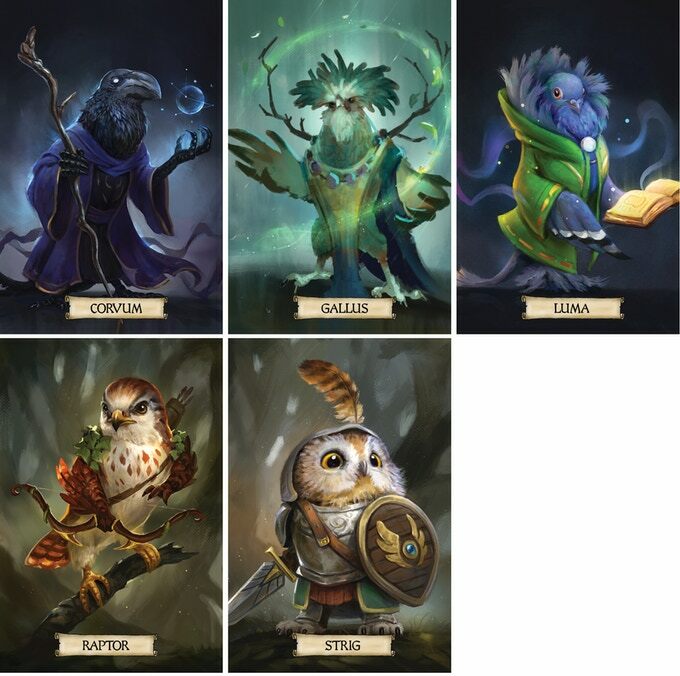 However, I’m not the only one interested in cute animal adventures, and the team at Ottawa-based Hit Point Press is meeting this demand with the Humblewood campaign setting for D&D 5th Edition. At the time of this writing, it has well exceeded its base funding goal on Kickstarter and is fast approaching the final of its three initial stretch goals (more on that below). Humblewood takes place in the eponymous forest, a sylvan kingdom ruled by the birdfolk who reside in the tree city of Alderheart. Other creatures are the avians’ humble subjects, the so-called “humblefolk,” who reside on the forest floor. The forest has enjoyed relative peace until the appearance of fire elementals that are now wreaking terrible destruction upon Humblewood, forcing the humblefolk from their homes and leading many of them to turn to banditry. It’s up to the birdfolk player characters to restore peace to their kingdom before it falls to ruin. The Kickstarter campaign has a number of scaling reward tiers that range from a print-and-play PDF of the game to $50 and $100 pledge box sets (regular and Kickstarter exclusive deluxe, respectively). The project also offers unpainted miniatures and deckb oxes for the accompanying info cards as tempting add-ons. I don’t always go whole hog on these games, but when I do, it’s because the artwork is absolutely gorgeous and the characters are adorable. There are only three stretch goals prepared for this campaign, which I consider to be a good sign that the team knows what it’s doing. Oftentimes on Kickstarter, promising releases collapse under the weight of their own success, so encumbered by the promised stretch goals that the games themselves take several years to reach the backers’ hands, if they ever do. That said, the stretch goal that I consider the most important—and that frankly I would have incorporated into the base game for completion’s sake—is the $150,000 funding goal, which will make player-character options for the nonbirdfolk races and expand upon the lore for each. As I mentioned, I’m looking for a setting that feels Aesopic, and to do that, players need to be able to select from a variety of animal races, not just birds. (Not that birds aren’t awesome, mind you; they are, but still.) The campaign has just under a month to go, though, and if its success up until this point is any indication, it should easily reach this stretch goal with plenty of time to spare, so I can back this game knowing with relative certainty that I’ll get to build and play that fox bard I’ve been thinking about for so long. The Kickstarter for Humblewood will close on April 11, 2019. You can follow its progress or become a backer here.